We&apos;ve talked a lot about the cattle drive this year, but what exactly is it and what&apos;s the historical importance of it? Local historian Doug Harman helps to break it down with these 10 must-know facts about the 150th anniversary of the Chisholm Trail. WHAT IS A CATTLE DRIVE? It is the movement of cattle to another location, generally for purpose of selling cattle and/or moving cattle to other pastures. The most famous cattle drives were from Texas to Kansas after the Civil War. HOW MANY CATTLE WENT UP THE CHISHOLM TRAIL? From the start of the trail drives in 1867 to 1871, millions of longhorns were taken to the Kansas Railhead. It is estimated that 10 million longhorns went up the Chisholm Trail and the Western Trail before new rail lines to Texas made the long trail drives no longer necessary. HOW LARGE WERE THE INDIVIDUAL CATTLE DRIVES? The typical herd going up the trail included approximately 2,500 cattle, 10 to 12 cowboys, a remuda of extra horses, and a chuck wagon for food and gear. 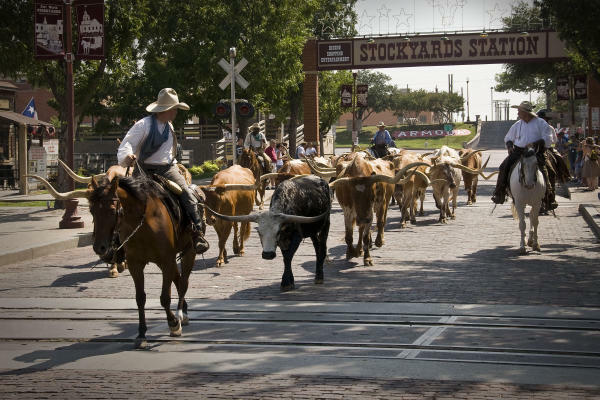 Sixteen longhorns and six drovers walk in the Fort Worth Herd cattle drive that can be seen daily in the Stockyards. WHAT WAS THE ROUTE OF THE CHISHOLM TRAIL? The cattle taken along the Chisholm Trail came from south Texas toward San Antonio and straight north past Belton, Waco and Fort Worth after crossing the Red River. Chisholm (1805 – 1868) was an important trader and plainsman of Scotch and Cherokee background. He was fluent in 14 Native America languages and played an important role in many treaties between tribes and the American government. The cattle drives were adapted from his trading routes hence where the name comes from. WHAT WERE THE VARIOUS NAMES FOR THE CATTLE DRIVES? 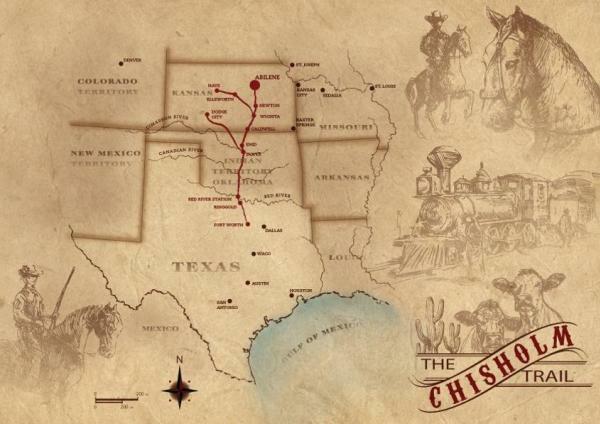 According to the Texas Historical Commission, the Chisholm Trail had various other names, including the McCoy Trail, the Great Texas Trail, the Cattle Trail, the Eastern Trail, and the Kansas Trail. WHAT IS THE CONTROVERSY OVER THE NAME OF THE TRAIL? Some people assert that the Chisholm Trail was not in Texas and that it instead began in Oklahoma. However, according to the Texas Historical Commission, in common usage, the name Chisholm Trail was applied to extensions of the original Jesse Chisholm Trail covering the length of Texas. The major books on the Chisholm Trail by Wayne Gard and Don Worcester as well as the federal legislation directing the study of the Chisholm Trail and Western Trail also take this view. WHERE DID THE TRAIL DRIVE THROUGH FORT WORTH? Many of the trail drives came through downtown Fort Worth along what is referred to today as Commerce Street before bedding down the cattle north of downtown. The drover (cowboy) would purchase supplies in Fort Worth before heading on. Joseph McCoy (1837 – 1915), was a cattle trader and largely responsible for creating the Chisholm Trail. He conceived the idea for a railroad extension to Abilene, Kansas, where he then developed cattle pens needed to house the cattle on rail cars. He then promoted the appropriate route for cattle drovers to take. WHY WAS IT NECESSARY TO DRIVE CATTLE TO KANSAS? After the Civil War, millions of cattle running wild in Texas were worth only $2 or less per head, but worth $15 to $25 per head in Kansas. The money from the sale of cattle was responsible for bringing Texas out of the economic depression caused by the war. 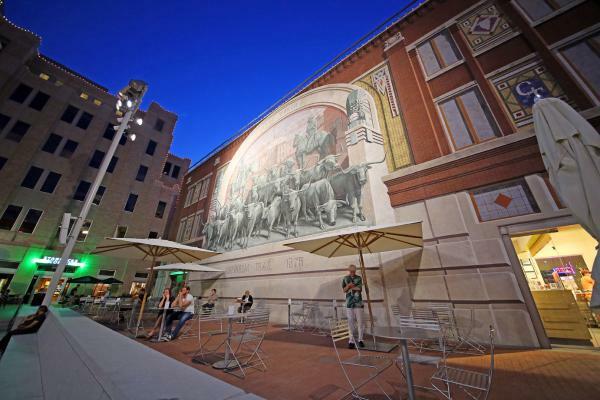 Follow the trail through Downtown Fort Worth and the historic Stockyards. Sarah is the Assistant Director of Public Relations for the Fort Worth CVB and covers a variety of topics.